Japanese automobile major Toyota has an India-specific small car strategy in place, finally. Its India unit will source two cars manufactured by Maruti Suzuki, the Baleno and Brezza, including their hybrid variants, and in return Toyota will offer its Corolla sedan to Maruti. These vehicles, with some changes, will be badged under the name of the company selling them. With this move the two companies aim to strengthen their position in a car market that is touted to become the third largest globally by 2020. The carmakers had signed a business partnership in February 2017. In November, they said they would jointly develop electric vehicles for the Indian market by 2020. With a sub-5 per cent market share, underutilised capacity, relatively smaller product portfolio and smaller sales network, Toyota’s India unit is likely to be a bigger beneficiary of the mutual supply deal. 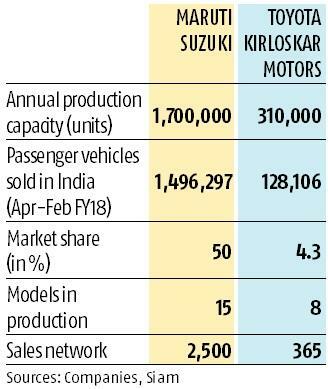 Maruti Suzuki, which already corners more than half of the passenger vehicle market in India and boasts of a large product portfolio, doesn’t seem to gain much from the deal. R C Bhargava, chairman of Maruti Suzuki, said the announcement should be looked at in the larger context of the cooperation between Toyota and Suzuki globally. “The partnership is of great importance to Maruti Suzuki. It provides access to technologies that are not available readily. Toyota is much advanced than others in electric and hybrid technology and safety of vehicles. They also need to gain in return,” he said. He said these cars need not look identical and the names like Baleno and Brezza are indicative. “Buyers can buy from a Toyota or a Maruti Suzuki dealer. Common sense says there cannot be a significant difference in prices of the vehicles sold by the respective dealerships,” said Bhargava. Toyota has not been able to crack the small car segment in India, dominated by Maruti and Hyundai. It thrives on its large SUVs (Innova and Fortuner) and sedans (Corolla and Camry). 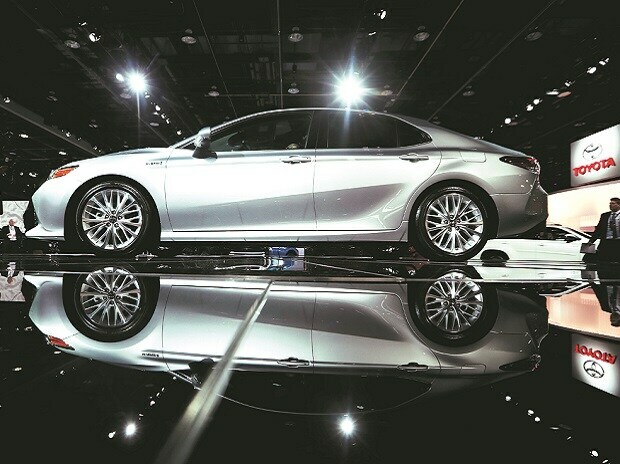 Maruti has marked a successful presence in the mid-size sedan market with Ciaz but will also benefit from Corolla. The joint statement did not specify details of each model, supply pricing, schedule of supply, number of units, etc. According to Japanese news agency Nikkei, Maruti Suzuki will supply Toyota 30,000 to 50,000 units of its premium hatchback Baleno and Vitara sport utility vehicle annually, while Toyota will provide Suzuki with around 10,000 Corollas in both hybrid and gasoline models. Maruti is learnt to be manufacturing a mild hybrid variant of Baleno for exports. “What we gain out of it is incremental sales, better utilisation of our existing capacities,” Shekar Viswanathan, vice-chairman and whole-time director at Toyota Kirloskar Motor, told Business Standard. For the year 2018-19, Toyota is targeting 150,000 vehicles, he said. It has an installed capacity to make 310,000 vehicles. “Some increment sales can happen through this partnership in 2019-2020. There is potential of an additional 150,000 units if these two (Brezza and Baleno) come in,” said Viswanathan. The supply of models from each company is likely to commence in the first quarter of 2019, said Viswanathan. Toyota and Suzuki would also step up local procurement for the three models, the statement said, adding the two “remain committed to the widespread acceptance and use of less fuel-consuming vehicles to help India reduce its environmental footprint and enhance energy security”. The Japanese duo will continue to explore other collaborative projects “that will contribute to the attainment of a sustainable mobile society in a manner that ensures fair and free competition,” the statement said. Intensifying competition, rising costs, stricter regulations and an emphasis on green technologies by the Indian government are prompting auto firms to collaborate and share costs. If anything, such non-strategic partnerships are a precursor to the auto companies working together to tide over the technological disruptions that are set to unfold over the next decade. Earlier this month, Mahindra and Mahindra and Ford India signed a slew of non-binding agreements to collaborate on future technologies and joint product development. “Today’s announcement is a win-win for both,” said Puneet Gupta, associate director at IHS Markit, a sales forecasting and market research firm. “While Toyota will benefit from Maruti’s reach and cost efficiency, an association with Toyota will help Maruti in bolstering its presence in the premium segment. Since the conclusion of last year’s memorandum towards business partnership, the two companies have been exploring concrete projects for collaboration in areas, including environmental technology, safety technology, information technology, and the mutual supply of products and components.